When you join a new organization, there different things to immediately work on. From understanding your core responsibilities to learning organizational SOP and adjusting in new environment, the list is quite a long. However, being a newbie in the workforce, time management in the office is the most vital of all skills as it determines your productivity and define your future direction. In addition, with better management of time, you get better at managing work-life balance and higher expectations by the bosses at the new company. Generally speaking, time-management is in fact life management. It is vital soft skill for somebody who wants to succeed in the modern work environment where expectations are high and we are always asked to do more in less time. In the following, we are sharing some easy-to-adopt changes to drastically improve your productivity. Are you clear about what is expected of you? It is very crucial because it defines about what you should spend your time on. Rather than keep guessing your responsibilities, save you time and get a clearer guidance on what is expected from you. This is the keystone of improved time management in the new workplace and essential if you really wish to be productive at work. If your understand your role well, setting right expectations and performance metrics will be easy for you. Many people are extremely good at creating to-do lists, yet never appear to get around to marking any of the things off! In case you ever get a chance to face this kind of challenge, try scheduling each to-do on your calendar. Give a chunk of time on a certain day to everything on your list, do your performance audit, and you will be surprised at how fast you will complete it all. You can take advantage of latest mobile and desktop applications to manage your to-do list. Even Google calendar can help you manage and schedule your tasks as per week/day/hour and reminds you about its status. Setting your goals is the most crucial thing for better performance. Setting short and long term goals will give you a chance to plan deadlines so you can adapt if necessary. When we join a new company, we are very much ambitious and willing to do more to create value that may help us in creating positive image. However this ambitiousness may lead to illusion, unrealistic goals-setting and result in disappointing performance. So, have straight forward discussion with your immediate boss about expectations and performance metrics for your role. A bonus tip for goal setting is to use Brian Tracy’s success formula and do a daily goal-setting exercise. Set up your daily goals night before to wake up with a ready to-do list. Psychology suggests that when you sleep, your mind keeps working on your problems related to your to-do tasks and when you are awake, provides you the needed suggestions to perform the very task in an effective manner. So make daily goal setting a habit. Find your stress factors and take steps to exclude them. Whether it is filthy surprise letter from the IRS, credit-card company ruthless conduct, or a complaint from your best client, your inability to understand a particular part of the job/task, or some irritating peer; do what you can to get hold on the issue quickly so you can move ahead. Share your problems with the seniors or your mentor to get the best practical advice. How often have you seen fellow colleagues fighting small crisis that can be avoided if somebody gets it right at the first run? Whatsoever you are doing, try to make things right in the first time. Have a high personal standard that says nothing leaves your hand unless you know you have tried your hardest. Although, this time management tip in the workplace is very easy to follow, but is not that much easy to practice. Chances are that as a newbie, you will most probably rush through your work expecting that speed is a surrogate estimation of effectiveness. Not really, quality of work is vital as well. Jumping over and over again starting with one activity to the next is a big time-waster. If you file a piece of paper then make a call then send an email then document one more piece of paper, your brain needs to switch gears at each stage. Rather, try to finish all of one kind of task before moving onward to the other task. Make most of your calls, do the all of your filings, and then send all of your emails. Doing this, you’ll see that you move speedier and get more tasks done in less time. Two things that can extremely disturb your work performance: stress and negativity. Practicing great time-management systems serves to reduce stress by keeping your work on calendar and fit as a fiddle to meet approaching deadlines. When you’re less focused you’re also likely to feel negatively about your job. Having a negative attitude at work can hurt your career, as businesses need people who are excited about their work. 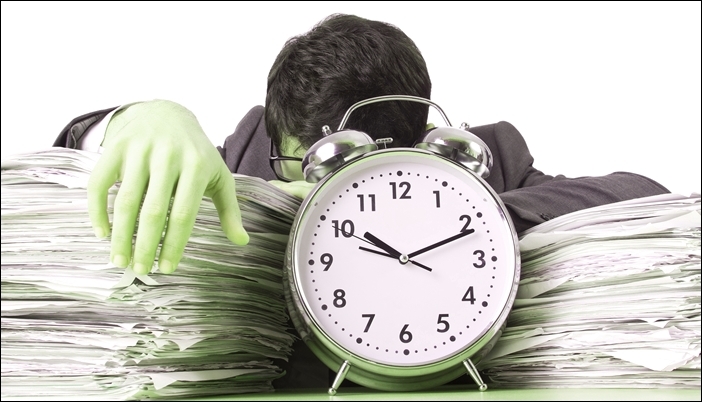 Since appropriate time management helps you fulfill ore in the apportioned time, it can help you get a more optimistic attitude in the workplace. Technology has brought us some handy tools to ensure improved productivity and enhanced performance. Use mobile apps (as noted above) for your tasks management, and if you’ve some repetitive tasks, use automation technology. For example, if you are a digital marketing professional, tools like HootSuite, TweetDeck etc. can save your lots of time by automating your shares/tweets and improve social media management. Similarly, marketers/sales people have a plenty of repetitive tasks like emails to prospects and reaching them out after a particular activity/interest. In that case, CRM and marketing automation platform can be big source of relief as they automate your “welcome” and “thank you” messages at the most primary level. It is hoped that the above given suggestions will help you manage your new role in a balanced manner and guide you to the optimal performance. If you don’t want to miss anything from Makesbridge, subscribe to our newsletter or follow us on Twitter, Facebook and LinkedIn.